Murphy, Wanda Herndon. A Comparison of Black and White Daily Newspapers' Editorial Opinions Regarding a Selected Set of Events Related to the U.S. Involvement in the Vietnam War: A Systematic Content Analysis. 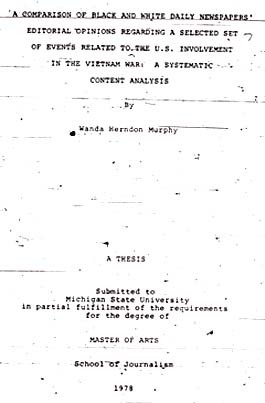 Thesis: Michigan State University. 1978, 124 p.